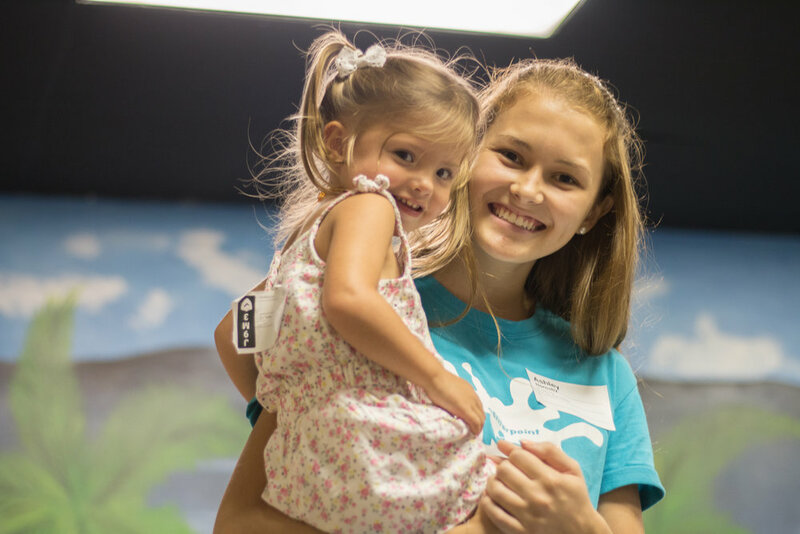 The goals of our Children’s Ministry are for children to meet new friends and to grow in their faith. We believe the Bible should never be boring, that worship can be really loud, and that leaders always care. We believe it is important for your children to learn these three basic truths: God made me, God loves me, and Jesus wants to be my friend forever! Our Preschool Environment is comprised of three rooms: Up to One Year, Ones and Twos, and Threes and Fours. Each room has age-appropriate toys and activities that will reinforce one of the three basic truths. If your child is from the age of one to four, he/she will hear a Bible story and then do a craft and/or activity that compliments the lesson. We also have resources available if you would like to work on the memory verse for the month or to do simple devotions with your children at home throughout the week. If your child is not potty trained, please bring diapers/training pants and wipes (we have extra on hand). Also, feel free to bring sippy cups and nut-free snacks (we do offer snacks, usually Animal Crackers or Goldfish, during story time) and any comfort object your child prefers. We believe it is important for your child to learn these three basic truths: I need to make the wise choice, I can trust God no matter what, and I should treat others the way I want to be treated. In our elementary environment, we believe the Bible should never be boring, worship can be really loud, and good leaders always care. Each service is broken into large group and small group segments. We designed this environment in such a way that your child will look forward to coming to church and to meeting new friends. The children begin in their small groups (divided by grade level) and then move into a large group time with games, worship, and a lesson. They return to their small groups to do activities that relate to the lesson. We also have resources available if you would like to work on the memory verse for the month or to do simple devotions with your children at home throughout the week. Just your kids! Make sure they are dressed comfortably enough to be able to sit on the floor and to do various activities. While you are in the adult service, your child is experiencing safe, dependable care from our thoroughly trained Bridge Builders (volunteers). Each volunteer has been background checked. All entries into the Centerpoint Kids are locked fifteen minutes after the service begins and remain locked until the service ends. We also have a Safety Team that monitors the premises before, during, and after every service. We have an easy to use sign-in system that allows us to keep track of every child and parent who comes into Centerpoint Kids. Sign-in opens fifteen minutes before each service. When you sign-in, you and your child will be entered into our security system and your child will be given a name tag with all of his/her relevant information. You (the parent/guardian) will be given a security number that will appear on the child’s name tag. If you are needed for any reason while you are in the adult service, the security number will simply flash onto the large screen in the auditorium. You will need your security tag in order to check your children out of Centerpoint Kids at the end of the service. Want to keep up with the latest Centerpoint Kids news and information?